Weehoo, I finished it, I finished it! The last two hundred pages made me feel like Frodo climbing up Mount Doom and now that I'm done I feel like Frodo laying on the mountain waiting to die...well, perhaps I exaggerate. I don't know how I stuck it out to the end - I suppose it has to do with good ole' Samwise Gamgee, always there to carry me through. Except that's a lie, there was no Sam, I had to tough it on my own. Booo. But it's all over now, so that's that. As you might have gathered from extended Lord of the Rings metaphor up there (sorry, couldn't resist, watched 7.5 hours of LotR movies last weekend), I was not very happy with this book. Honestly, I was immensely disappointed by it and I am greatly impressed by those who are not. 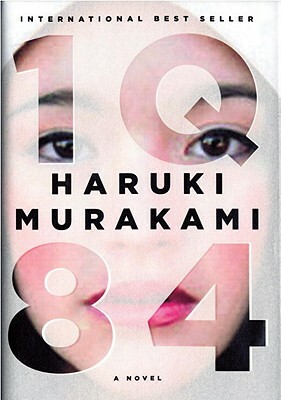 Interestingly, I also wasn't that impressed by the book that preceded 1Q84...I hope Murakami's not losing his touch! (Although I did like After Dark more than this 1Q84 if only because it's a fraction of the length...). Why did I not enjoy this book? Somehow, I managed to make it through books one and two without being to upset. No worries, this is how Murakami is, I'm sure it'll all come together in the last book. The last book was fairly different from the first two, though, and by the time I was around page 700 I wanted to give up. What had gotten me in that far was Murakami's prose. I don't know what it is about his writing style. I can't tell you why I like it. I just know that I can read 30 pages at a time no problem, just patiently reading every word and enjoying the flow of his words. Had this book been written in anyone else's style, I probably would not have made it through. The best part of 1Q84, however, is probably the book design. The cover image I've posted above doesn't do it justice. The translucent book jacket, the overlapping images, the symmetry and the soft smooth pages made this book somewhat easier to read. Who knows, maybe I just totally missed the point of this novel. Maybe it's just not for me. I felt like the story was greatly lacking even though I liked the characters (I didn't talk about the characters at all in this post and I don't feel like saying anymore. But I did like Tengo and Aomame and sometimes strange Fuka-Eri and weird Ushikawa). At least I have a pretty book for bookshelf.